We are pleased to share that Fine Homebuilding recently recognized our work in their 2015 awards issue. This 550 sq. 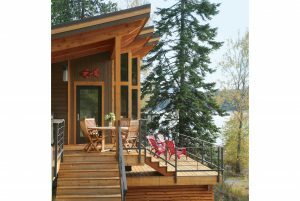 ft. 1 bedroom, 1 bathroom cabin was designed to maximize views on a lakefront setting while minimizing impact on the sloped site. See photos, watch a video, and read about the project here. Please send to me your 1850 sq.ft. floor plan. Thank you!